Near the end of the school year, I had the chance to see something amazing happening in one of the elementary schools in my school district. Marina Rodriguez (@mrodz308), a 4th grade dual language teacher at South Knoll Elementary, reached out to see if I would come by and participate in the “Hour of Blog”–a time she and her students use after school to explore all things blogging. She and her students, none of whom began the school year with any blogging experience, created hundreds of blog posts throughout their after school “Hour of Blog” they began together during the spring semester. Our time together went so quickly. The students asked wonderful questions and shared insights beyond their years. A lot of people would look at the end product and want to replicate it, but not know where to get started. I asked if she would share about her experience. Marina was happy to share about the project and offer some tips for anyone who is interested in getting your students blogging. I also love the student and parent reflections she shares, too. Enjoy this post from Marina Rodriguez, and get your students blogging! Back in January of 2017, I decided to bring blogging into my 4th grade dual language classroom. With state testing right around the corner, I wanted to offer my students something engaging they could experiment with, lead, and make their own. I caught the name of a blogging website called Kidblog off a post on Twitter, and the only thing I knew for sure was that this blogsite was safe for kids. My initial concerns were many… How would I introduce something I have never done before? When would we find the time to practice this unique genre? Are my students mature enough to handle working independently online? Will the novelty of trying something new fizzle out before we get anything valuable accomplished? How would I make sure students practice good writing habits? How would I manage it all for so many students, when they will have online access anywhere, anytime? Is it crazy to try to do this on my own with 4th graders? Even with the many concerns, blogging online seemed to carry possibilities that would excite our learning and launch us into something new and wonderful. After talking with a small group of my students for some feedback, we decided to make it an experiment. I decided to trust that my students would at the very least have fun trying something new. I took a breath and we jumped into the digital world. What happened in my classroom those next few months of school was nothing short of amazing. My classroom shifted. We went from a classroom to a community, from students to guides, from rule-followers to leaders… independent problem solvers, collaborators, creators, innovators, and explorers. Learning became contagious. Students kept a “Blogger’s Notebook” and worked hard to find reasons to write, and they wrote often. During this process, I became a part of this magnificent shift in our learning environment. I became a guide and an actively engaged learner. I learned to trust myself as I pushed to learn more, just as I encourage my students to do the same. This adventure helped me to become a blogger. I also discovered that my students, my bloggers… are some amazing human beings. They ended the school year feeling like a part of the world around them, thinking beyond the walls of the classroom, and ready to make an impact. Let your students in on this secret… the more you write, the better you get at it. Here are a few other reasons… to value student voice, to give students meaningful and purposeful reasons to write, to allow students to learn for themselves and learn from each other, to allow students to make an impact on the world, to connect with others and build relationships, to experience having an authentic audience, to struggle and reflect, to explore, to grow, to research, to collaborate, to problem solve, to create, to innovate, to practice critical thinking, to prepare for the future. There are many other reasons why blogging can be powerful for students. Blogging helps students learn, reflect, and grow. Encouraging students to write what they want as much as possible is a powerful way to grow writers and critical thinkers. When students have the freedom to lead their own learning, amazing things will happen. Making expectations crystal clear is key for just about anything. Picture your ideal learning environment, then let students in on your vision. Together, you can build towards that goal. Teach mini-lesson, after mini-lesson, offer reminders, reviews, notes, etc., as much as you see is needed. In an ideal learning environment, everyone is a learner, and everyone should develop the skill of guiding others to learn new things. The goal is to have a room full of independent, critical thinkers, and creative problem solvers. With the right guidance, a classroom can quickly become a place where both students and teacher carry the title of Guide, where everyone is able to offer what they know with respect and willing to help others in the process, not because it is a mandate, but because it’s the right thing to do. It is easier to manage things when you start small. Begin with a group of 6-8 students who you think would not have issue with independently making decisions, setting goals, expectations, etc. These students can be your mentors for the rest of the class. Guide your small group in the right direction, but allow them the freedom to lead and make decisions. Hold special blogging meetings during lunch or before school, to help launch and establish their special leadership positions. Encourage a plan for everything, so they understand that things work best when planned. This will give students ownership, and naturally allow them to develop the need to care and protect their work with great passion. Students will often set the bar much higher than you expect, and will lead other students to do the same. Inquiry learning is phenomenal. Encourage students to use blogging to share what they learn. When children begin school at the age of 4-5, they come in excited and ready to explore the world, often with spectacular curiosity. They are typically ready to jump into learning and exploring with little fear or hesitation. As the years in a classroom begin to lay its heavy hand on their curious minds, students become less of explorers and more rule followers. Allow for natural curiosity and exploration to develop through student inquiry projects. Blogging about an inquiry project is a fantastic way to bring back a student’s inner explorer. Students practice developing a higher-level ability to think through what they want to learn and make good choices, not because “the teacher” told them so, but because true explorers and learners must make good decisions as they push to learn more. Encouraging the explorer part of a student’s brain is essential to having a student-centered learning environment. Allow students to investigate, research, and write about the things they enjoy or find intriguing and/or interesting. It can lead to some powerful learning. Sharing student work with an authentic audience can make a powerful impact. I still remember the look on my students faces, when we talked about having their parents and other teachers read their work. They were both nervous, but incredibly excited. These experiences help students truly own their work, and it helps them to understand the true purpose of this communication skill we call writing. It’s more than developing a writer or blogger, it is showing students that their words have value and can cause impact. Publishing for a target audience helps students understand that the value of their own voice. Not only is it important for students to publish and publish often, but by focusing on specific audiences, students practice real-world communication skills. Writing to specific audiences is a skill that students will use for the rest of their lives. The best advice to give students is that they are responsible for being good humans, both inside the digital world and out in the real world. The difference between having digital citizenship and being a good human is absolutely nothing. The sooner students understand that who they are online is who they are in real life, the better. Technology is a part of our everyday lives, and students need us more than ever to help guide them into making good choices. Trusting that students do the right thing may sound like a lot to ask, but it is well worth the investment when student-centered learning is the goal. Most students would rather participate in the digital environment to learn, than to be denied that option for poor choices. Guiding students through their first piece is important, because it sets the expectation. Our 21st Century Students know a lot; however, they need our experience and our guidance now more than ever to help keep them on the right learning path. Don’t expect perfection, expect their best work. You may want to approve the first few blogs before they post to an audience, however, only a teacher knows when best to move a student on to what comes next. Make sure to give them the freedom to write without your approval at some point, better sooner than later. Try to read all of their work, as much as possible. When students begin to write more than you can keep up with, you have succeeded in creating a group of students who are living as writers. All four components can easily be embedded into blogging. Making sure students understand why these components are important will help keep them focused on the big picture… their future. The best way to lead students into blogging is leading by example. Diving into something new with your students is a priceless experience for both you and your students. It turns everyone into a learner instantly, and allows both the teacher and students the opportunity to live as true explorers. What an amazing experience to offer students! Sharing experiences, good and bad, reduces the fear of making mistakes and builds an environment where students feel safe to learn, grow, take risks, and push forward to become life-long learners. Give yourself and your students time to develop. Again, only the teacher knows when her class is ready for what comes next. The use of a program that allows students to write electronically anywhere they have access to the internet is exciting. They will develop quickly the need to write, and write often. They will make mistakes, and you will need to help teach them how to pick up the pieces, how to make their writing stronger, fresh and fearless, or more impactful. It will take time, but it will happen sooner than you think. Technology is in integral part of the lives of our students. 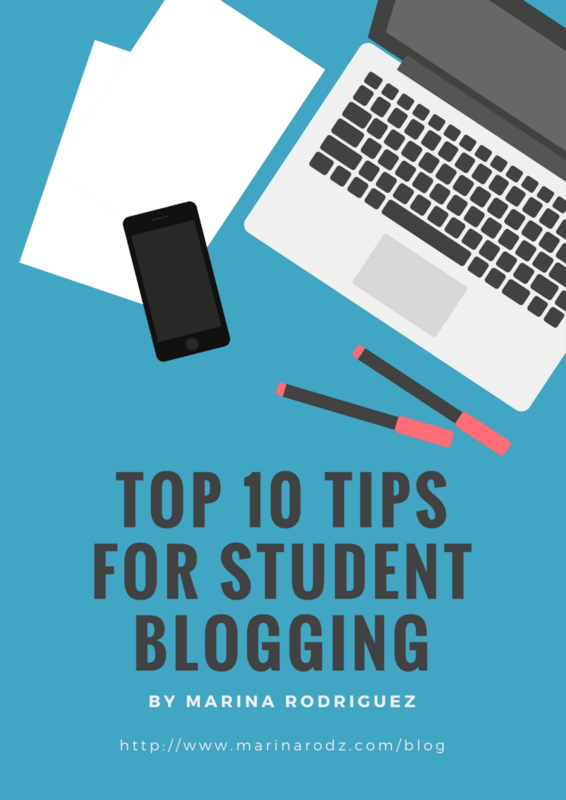 Blogging is one way to help students maneuver in an environment that will continue to be an important part of their lives. Preparing our 21st Century Students to become leaders in a world already at their fingertips is not only important, but necessary. Be sure to check out Marina’s blog (www.marinarodz.com/blog) and connect with her on Twitter (@mrodz308). I have blogged with students in the past and it can be a hard thing to get them on-board with. It is so unique, especially once comments enter the fray. What also needs to be recognised are some of the challenges, such as administration and expectations. (I have reflected here https://readwriterespond.com/2015/08/blogging-in-the-classroom-a-reflection/). Sometimes the best place to start can be a collaborative space, which allows for a hive of instantaneous traffic. I like the idea of creating something akin to a social media hub (https://readwriterespond.com/2015/12/creating-deliberate-social-media-space-students-school/).